Thomas Adkins is a seasoned veteran of plein air painting. Most works begin with on location studies 16” x 20” or smaller. Adkins then composes larger works in his studio, compiling sketches, additional studies and from memory. His most recent works have been in Woodbury and Southbury, along with works of the Down East coast of Maine. A Southbury resident, Thomas Adkins is a graduate of Paier College of Art of New Haven. After graduate classes at the School of Visual Arts of New York, he worked as art director and creative director for some of Connecticut’s and New York’s most prestigious advertising agencies. Adkins has won numerous awards for his designs, illustrations and paintings. His work has been purchased by GE, IBM, Kraft, Minolta, Hilton Hotels, Timex, Wendy’s and other major corporations. Twice exhibiting in the Mystic International Marine Exhibition, Thomas has had many one-man shows and group shows. His work is carried by prestigious galleries, such as Cavalier Gallery, Bayview Gallery and PH Miller Galleries throughout New England. As a contemporary painter of the New England landscape, Adkins is inspired by frequent visits to the neighboring farms, coast villages, and pastures of Connecticut and Maine. His style and technique have developed from early influences by impressionistic painters of light on nature, such as Monet, Pissaro and Willard Metcalf, and contemporary painter Peter Poskas. 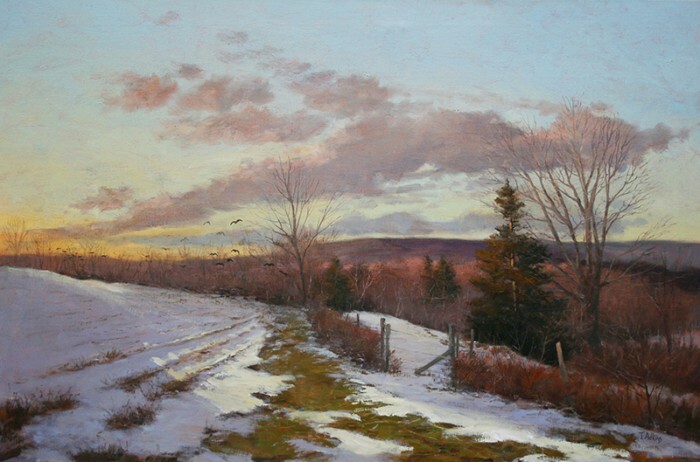 Adkins has the rare ability to capture the subtle nuances that make up the ever-changing beauty of light on the New England landscape in a realistic, contemporary way. Thomas Adkins’ work can be viewed at the Gregory James Gallery in New Milford. For more about Thomas Adkins and his paintings, go to his website: thomasadkinsfineart.com. To contact him: tom@sabinc.com or at 203.262.1696.